After yesterday's breakthrough I was really looking forward to improving today, and getting some more shots for my 2019 Calendar. And, happily, I can say...I was on a roll today! Finally, I'm getting my head around my equipment and starting to take some nice shots; definitely I've got at least one in the bag for the calendar. We headed up the mountain (because that's all we seem to do!) and made it (with a few hairy moments) to the fabled vista that we didn't quite make on Day Two. And it really was a stunning spot. 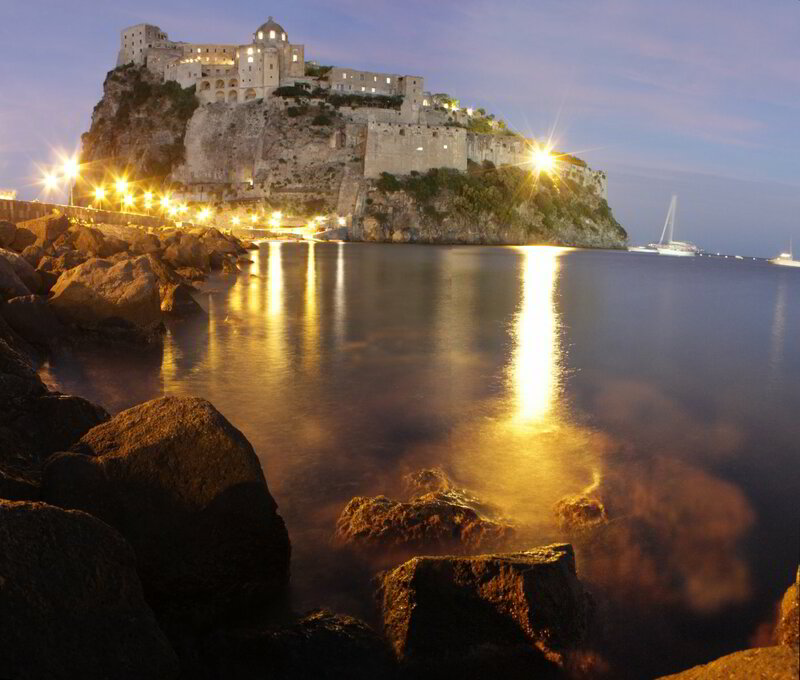 Alas, it was also not quite right for the shot I had in mind, which was getting Ischia's famous castle, as the famous castle was hidden round an unfamous spit of headland, poking into the sea. Now we're getting somewhere! I took a bunch of shots and will work on the RAW files later (cropping, amending the colour, etc), but definitely this sequence of shots has given me a good Calendar contender. HUZZAH! I like the angle, but I'm starting to realise the limitations of my lens (which came with the camera). In a way, that makes me happy; it means I really am learning! Nonetheless, it's still a good shot and so, fired up, I begged Simona to return me back up the mountain a little; we'd passed a small gap in the foliage on the way down that I thought had a really nice view. Whilst I'd been off being snap happy, Simona had arranged to meet up with our friends from Day One, so the kids could play together. So we headed down the mountain to meet them, but I wasn't done. Simona dropped me at a point that would take me about 20 minutes to walk down to the castle at sea level (i.e. to Ischia Ponte). I wanted to try to catch the fading light as it hit the castle and then try some night shots. As an added bonus, it was Friday night which meant there was live music in the streets of Ischia Ponte, from 9 pm. So I arranged to meet Simona there later, once the kids were in bed, and went off on my merry way. So all in all I'm really happy with how it went. I can see my skills improving as I gain experience, experiment and get a better understanding of how my gear works. Which makes me really excited to see what I can come up with for my 2019 Calendar!